Cochiti Lake is a reservoir created by damming up the Rio Grande River. This area is part of the Cochiti Pueblo reservation. The US Army Corps of Engineers built this earth filled dam starting in 1965. It was completed in 1975. The dam is more than 5 miles long and is the 10th largest dam in the US. As with most COE sites, providing recreation opportunities is an important part of the development. At most COE sites there are very nice campgrounds with electrical hookups. Many have water at each camp site, some have waste connections. And with our Senior National Park Pass these sites are $8-$13/night. Apparently being nice to the people who lived there was not so high on the COE agenda back then. The Cochiti people lost significant areas of agricultural land and sacred areas flooded as the waters behind the dam rose. And a lot of farm land was flooded below the dam due to seepage through and under the dam. And then there were developers who wanted to take over large areas of land near the lake to develop a new town for recreation and vacation. They envisioned as many as 40,000 people. 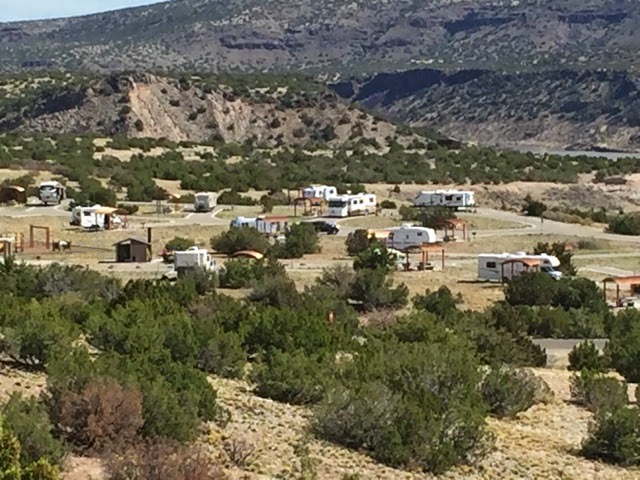 The current population of the Pueblo is less than 600. The Pueblo has worked to stop private development and to restore downstream farmland. The Pueblo now owns a gas station and store and laundry and a small housing development for members of the Pueblo. No other private development has been allowed. 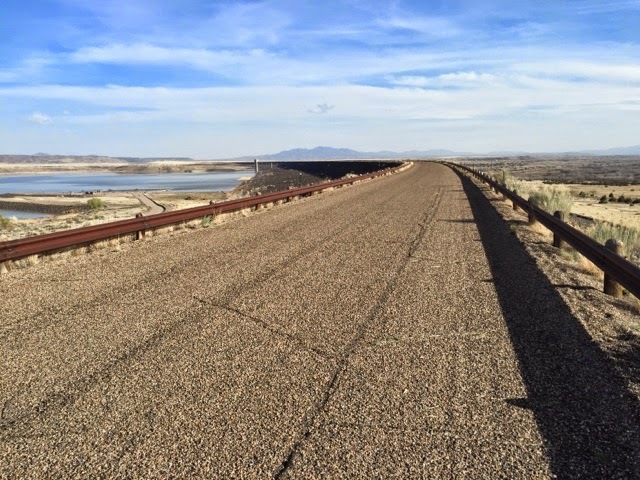 In an agreement and cooperative effort with the COE drainage and irrigation canals have been built downstream of the dam to help restore traditional agricultural lands. We (the coach) are near the middle of this picture. I was surprised the dam was as long as it is. The spillway to let the Rio Grande continue south is about in the middle of the dam. The water level seemed just below normal. The top of the dam was about at the height of the campground, 251 ft. above normal river level. The campground was about 200 ft elevation higher than the lake. It was another 300 ft climb to the Visitor’s Center. It was closed but scheduled to open in another week or so. I rode my bike up to the Visitor’s Center (about a mile away) and then down a bit and out on to the dam road. I had to go through two locked gates so I didn’t go very far. Homeland Security sort of thing I guess. This was a very nice stop for a few days to slow down after the Grand Canyon and before we get to Santa Fe where we will be for almost two weeks. Our friends Ed and Barb will be stopping for a 3-1/2 day visit on their way to California. It will be nice to see good friends. 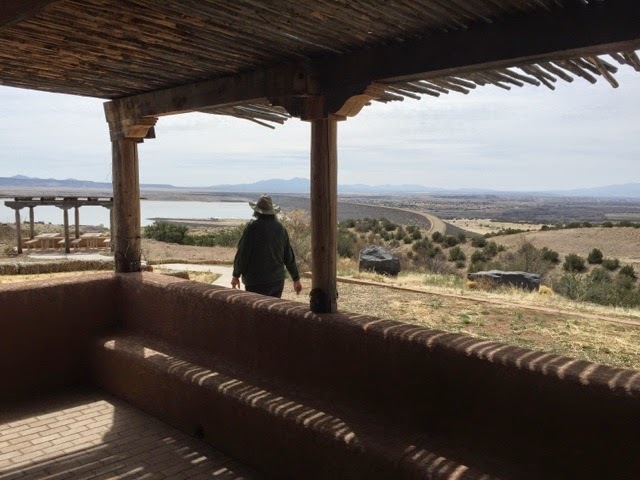 It was Easter weekend when we left on Sunday for the grueling 35 mile drive to Santa Fe. 😜 The campground and the picnic areas were full. The boat launch area was busy. There were sail boats and fishing boats and kayaks out on the lake. A helicopter was flying over to a small inlet way on the other side of the lake and dipping a firefighting bucket into the lake and then flying off a ways to dump it and back again and again. It was a reminder of the very high fire danger that exists in most of the areas we have been in over the past two months. Water is scarce here in the best of times. For now most of this area and Texas and California have been in a severe drought for the last four years. This is a place where we would return.